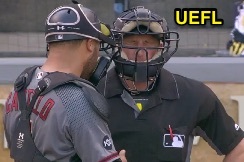 Umpire Chris Guccione left Wednesday's ARI-PIT game after a foul ball to the facemask in the first inning. With one out and the bases loaded, Pirates batter David Freese hit a 0-2 breaking ball from Diamondbacks pitcher Rubby De La Rosa into the center jaw and chin portion of Guccione's traditional-style facemask. Umpires Sean Barber (1B), Alfonso Marquez (2B), and Larry Vanover (3B) officiated the remainder of the game in a three-person alignment, as Barber replaced Guccione behind home plate and Marquez covered first base. Triple-A fill-in Ben May was called up to officiate first base in Guccione's stead during Thursday's game.